Isolated severe/tornado risk continues, and will shift gradually east/northeast with time. New WW may eventually be needed. 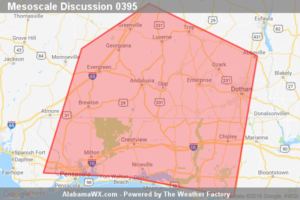 Isolated/limited severe risk persists across valid portions of the watch. Risk for isolated severe storms and a tornado or two continues. 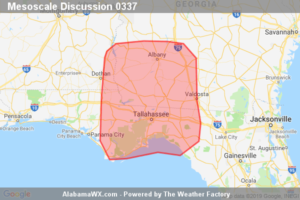 Trends are being monitored for a possible increase in thunderstorm organization and intensity during the next couple of hours over the central Gulf coastal region. A ww issuance is possible, but remains uncertain and will ultimately depend on convective trends. Threat for isolated damaging wind should persist next couple hours from west central through southwest GA into a portion of southeast AL. 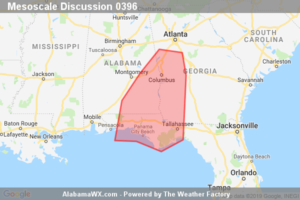 Storms are expected to develop eastward into southeast AL, the central FL Panhandle and southwest GA overnight. Primary threats will be damaging wind and isolated tornadoes. Trends are being monitored for a possible WW. 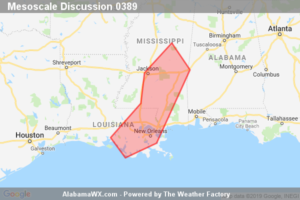 Threat for damaging wind and a brief tornado is expected to persist over southeast MS through about 03Z or 04Z. WW 83 is scheduled to expire at 02Z, but may be locally extended in time as needed. 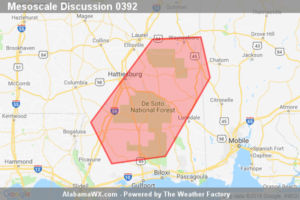 Threat for damaging wind and a couple tornadoes will persist from central to southwest AL and southeast MS through mid evening. 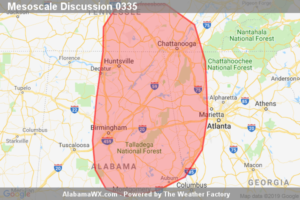 The most organized storms will approach the Birmingham metro area near 00Z and WW 84 can be locally extended as needed. Storms will move into the discussion area late this afternoon and early evening. Observational and numerical model trends both suggest and increase in the potential for damaging winds and tornadoes. 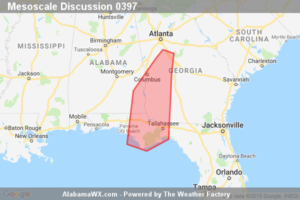 A tornado watch will likely be issued by 4 PM CDT. 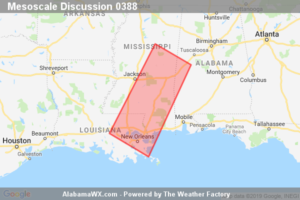 Short-term severe threat remains focused along a corridor from southeastern LA into eastern MS. Severe threat will increase across MS and southeast LA over the next several hours. 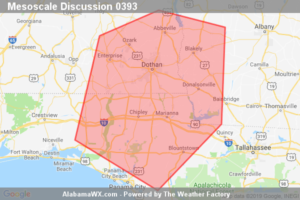 New Tornado watch will be issued by 19z to address this threat. 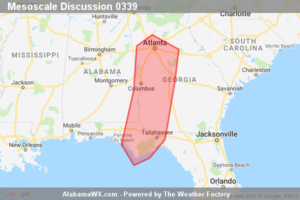 Increasing strong to severe storm development appears likely across west central through northern Georgia, including the Greater Atlanta Metropolitan area, by 5-6 PM EDT. Trends are being monitored for the possibility of a severe weather watch. 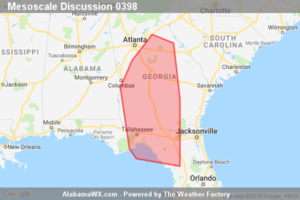 Widely scattered strong to severe storms will overspread the region through midday, particularly across areas south through southeast of the Atlanta metro area, accompanied by the risk for damaging wind gusts and a couple of tornadoes. 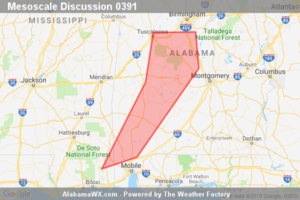 A broken band of storms continues to forward-propagate toward the discussion area and will pose a threat for tornadoes and damaging wind gusts. A WW issuance is being considered. The severe weather threat continues WW 58. The threat for tornadoes and wind damage continues for WW 57. A new tornado watch may eventually be needed downstream after 1030-1100Z. Click HERE to see the Radar Page. Click graphic to go to page. 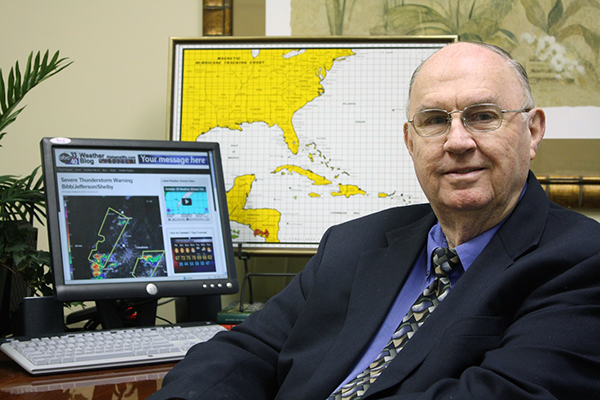 Our long time friend, mentor and charter Weather Factory member J.B. Elliott passed away on May 11, 2015. Click HERE to read James' tribute. 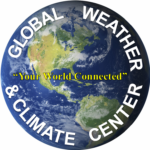 Contact Bill Murray at The Weather Factory at (205) 687-0782 to develop a campaign that will help your business thrive! 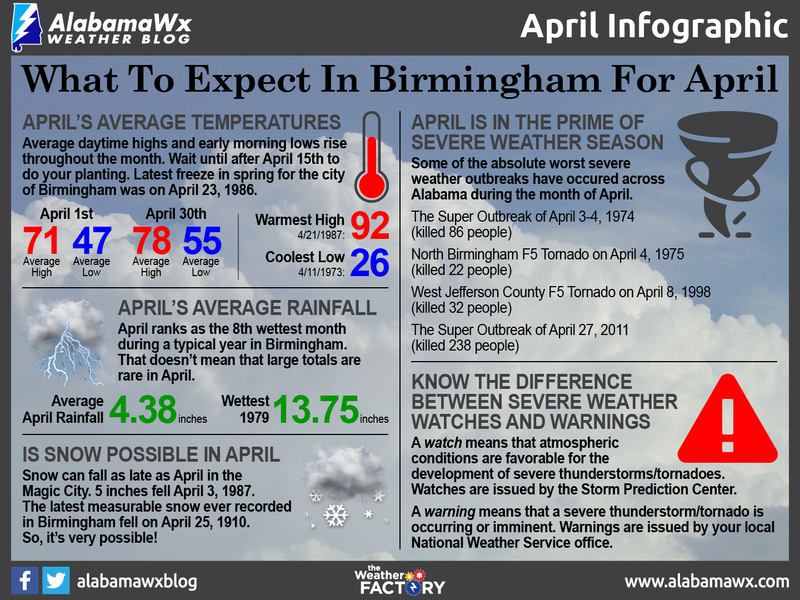 The AlabamaWX Weather Blog is a production of The Weather Factory. 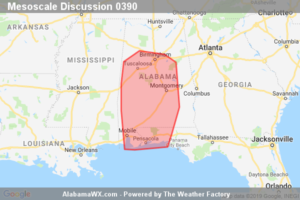 © 2019 The Alabama Weather Blog. All rights reserved. Premium WordPress Themes.